Poet Haile Bizen Abraha (b. 4 December, 1966) hails from the Eritrean capital, Asmara. Although formally educated in Educational Psychology at Addis Ababa University in Ethiopia, Bizen showed early promise as a young poet, gaining momentum and recognition for his unique style by winning competitions across Eritrean high schools, contests at the national level in Ethiopia, and at Addis Ababa University. After Eritrean independence, Bizen also won the first Eritrean Festival in the categories for poetry and short stories. In 1995, he began work as a journalist for the Political Affairs department of the PFDJ (People’s Front for Democracy and Justice, Eritrea’s ruling party), and as an editor for Hidri Publishers (also owned by the party). Bizen also served as a board member for Hiwyet, a private magazine, and the National Literary Prize Committee. After thirty seemingly interminable years of civil war, Eritrea finally achieved independence from Ethiopia in May of 1991. Bizen describes these first years of liberation as “years of inspiration and euphoria”, brightly colored by “family reunions, homecomings, stories of heroism, and future ambitions and dreams”. This peace was disastrously short-lived, and conflict started anew with the border dispute between Eritrea and Ethiopia escalating into war from 1998-2000. During this time of dramatic change, Bizen began to feel the constricting grip of despotism, and he gravely remembers, “all artists became under one command”. In 2000, he published a collection of short stories; because he, like the rest of the nation, was preoccupied by war for three years, his stories themes’ echoed thoughts of conflict and its effects. Bizen, along with a multitude of others, marks 2001 as the “official death of our new Eritrea”: on 18 September, the government ordered the closure of all privately-owned media outlets, officials were detained if they dared to question the lack of implementation of the newly-ratified 1997 constitution, and twelve prominent journalists were disappeared – presumably imprisoned and held incommunicado to this day. At first, Haile Bizen envisioned himself as a “young artist in a young nation”, though eventually, he says, “that hope started to melt, that dream started to evaporate, and every citizen was reduced to government property”. He describes these as “years of limbo”, permeated by military round-ups, arbitrary detentions, and security surveillance. Bizen completed his National Service under PFDJ for three years without receiving remuneration, while fighting to keep his personal and artistic integrity intact. He became obsessed with the word ‘silence’, and the concept of graveyards, which was reflected in his self-published collection of poetry, Bidhri Ma’exo’ (Behind the Doors). Ironically, the ‘silence’ that occupied so much of Bizen’s thoughts, was the very thing that propaganda chiefs and national security agents sought to impose upon him – somewhere along his journey for poetry and self-expression, he had become a dissident, subject to repeated interrogations and intimidation. Forced to flee in a matter of weeks, his departure obscured in a cloud of secrecy, Bizen left Eritrea in September of 2009 without explanations or farewells to his closest friends, or even his family – his children (only two and four years old) and his wife, six months pregnant at the time. Bizen was unprepared for the realities of the next three years as an asylum-seeker, moving between Uganda, South Sudan, and Kenya, until finally an opportunity was presented by ICORN in 2011 for him to be resettled in Norway as a guest writer. Bizen describes these interim years as characterized by long unproductive periods of writer’s bloc. Despite the mountain of new experiences and potential material, Bizen felt a lack of concentration, plagued by the desperation of his new voice: “the voice of nothingness, the voice of agony, the voice of despondency”. Though he remained optimistic for a reunion, Bizen’s communications with his family were scarce, fearing that his contact would imperil those back home, still living under state surveillance. Eventually, his family managed to leave Eritrea and join Bizen in Norway, but only after paying thousands of dollars in ransom for their release from human traffickers; he confides that, “still, as a family, we are struggling to cope with the psychological and physical trauma of the torture and harassment”. After prolonged silence, Bizen began to open up in 2014, knowing that he and his family were safe and settled in Kristiansand. 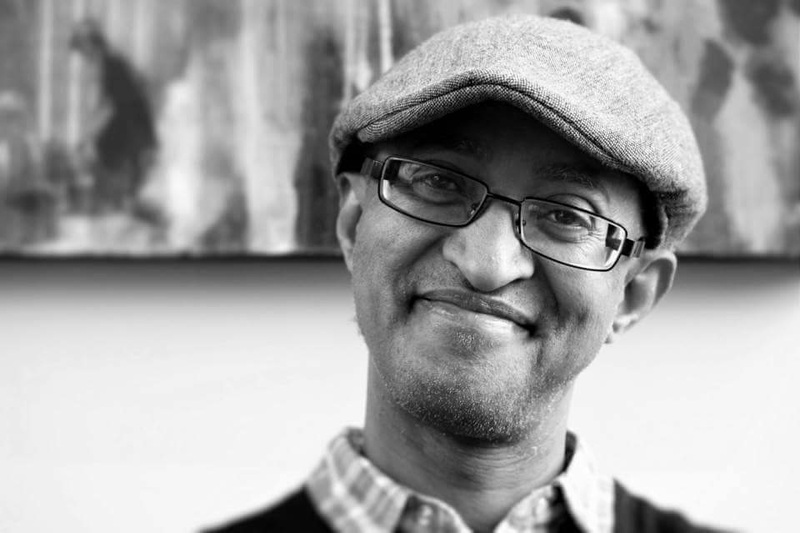 After commencing Norwegian classes, he began to translate children’s stories from Norwegian to Tigrinya, and “Karius og Baktus” was published by Cappelen Dam. Bizen has also published an Ebook in celebration of Norway’s 200-year Jubilee, with one poem for each article of the Constitution. 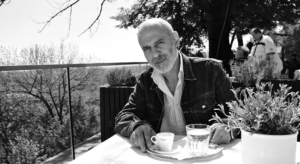 He credits this publication with the reigniting of his poetic consciousness which in turn led to a productive period of original poetry and translations between 2015 and 2016. Inevitably, his first poems from Norway were colored by deep anger and nostalgia for the things he was forced to leave behind; themes revolving around home, displacement, and his ‘new space’ led to the online poetry series “Ode to Exile”, as well as contributions to the Norwegian PEN guest writers’ Anthology, A Manual for Writing a Whore Poem (Instruks i å skrive horedikt). Apart from the obvious benefits of better material resources and an increased sense of security, Bizen enjoys the connections his new home has allowed him to foster with writers from various countries who have shared similar experiences. He comments, “I have been invited to different literary festivals and readings which continue to inspire me to produce new works. It similarly opened up for me [the opportunity] to explore many talented writers from other countries. Yet, I still remain eternally tied to my home country, and can’t [seem] to budge psychologically”. Of course, in living an entire lifetime under conflict, war becomes an integral part of one’s identity; Bizen’s sense of self has been forged as much by fear, politics, and sadness, as it has by poetry, family, and beauty. Recently, however, an opportunity to engage positively with his lasting connections to Eritrea presented itself– at the annual PEN International Congress, held in September 2016 in Ourense, Spain, Haile Bizen was officially announced as the new President of PEN Eritrea. The organization currently operates in exile, since the restrictions on freedom of expression are so severe in Eritrea, with the country consistently ranked last in the world in the World Press Freedom Index (RSF) for the past eight years. Alongside the continuation of his writing, Bizen has been working tirelessly in cooperation with Board Members, as well as partners in Norwegian PEN to propel PEN Eritrea forward as an initiator of political and cultural change. Asieh Amini, poet, journalist, and activist, was born in 1973 in Mazandaran Province in Northern Iran. 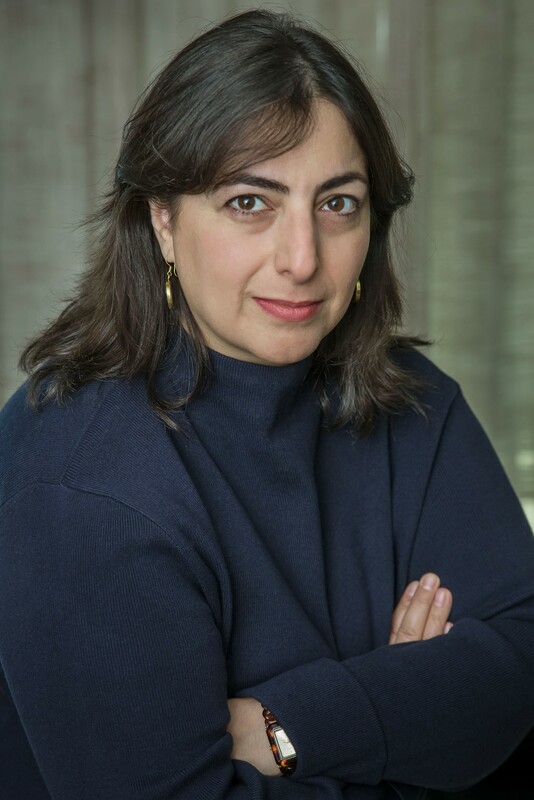 While completing her studies in journalism at Allameh Tabataba’I University in Tehran, Amini worked for several newspapers such as Iran, Zan, and Etemaad (where she worked as social editor), and would later go on to manage the website “Women in Iran”. From 2004, Amini fought indefatigably to garner international aid and attention for Iranian cases of stoning, juvenile execution, and various kinds of discrimination against women and girls. In October 2006, Amini co-founded the campaign “Stop Stoning Forever”, and became fully immersed in her work as an activist for women’s rights. Her seminal work in journalism has helped to expose Iran’s ongoing stonings, despite Ayatollah Shahroudi’s 2002 moratorium banning the practice. Amini has emerged triumphantly from a world of arrests, threats, discrimination and censorship to be lauded for her achievements worldwide. In 2005, Amini’s first book of poetry was selected by UNESCO’s office in Tehran as the best poetry collection from young and emerging Iranian poets. Her other accolades include the Human Rights Watch Hellmann/Hammett award (2009), the Oxfam Novib/PEN award (2012), and the Ord i Grenseland Prize (2014). After a brief imprisonment in 2007, Amini continued her work and activism under pressure. Following a controversial presidential election in 2009, she left her home and eventually came to reside as an ICORN guest writer in Trondheim (2010-2012). She published her first poetry collection in Norwegian in 2011, entitled Kom ikke til min drømmer med gavær (“Don’t come into my dreams with guns”, translated from Farsi into Norwegian by Nina Zandjani), which was followed by a second collection in 2013, Jeg savner å savne deg (“I miss missing you”). Amini underlines that although her work fighting stoning and the death penalty is of grave importance, and the number of executions in Iran has even increased, these causes should not overshadow various other issues concerning human rights in Iran. Amini asserts, “I believe that the basis of transition and change should be arranged within a society, and in connection with a world community of civil societies. Unfortunately, in Iran, we have had problems with both”. Despite fierce and dedicated activism in the fields of women’s rights, workers’ movements, student movements, human rights groups, and media, Amini feels that the voices of these civil society activists are often silenced domestically, and “hardly heard in the international community because of political and economic interests”. When asked to highlight a single issue for the international rights community, Amini replied unequivocally: “the freedom of expression of independent civil society. After the Islamic revolution in 1979, and especially after the political conflicts in the 1980’s, during which thousands of people were imprisoned or executed,[Iranians] have never really experienced freedom of speech”. Amini compares the initial shock and impact of moving to Norway to a business man suddenly losing all of his wealth; “as a poet and journalist, [your] language and audience are your wealth. You can’t bring them to your new home when you move”. Amini recalls her tears upon hearing her daughter speak in her sleep, in a language her mother could not understand. The challenge of a new life caught Amini on the precipice of an abyss, in danger of falling into a deep depression. Rather than tumble over the edge, Amini gritted her teeth, learned Norwegian, and moved forward fearlessly. She credits her continued success in Norway primarily to her family, and to her ICORN coordinator. The latter’s efforts and familiarity with the challenges that face new guest writers helped to ease Amini’s transition into her new community, and aided in creating a growing network that would allow her to continue her work as a writer. Amini is currently working on a new documentary book, as well as a new book of poetry, while simultaneously completing a Master’s at NTNU in Equality and Diversity. She continues her fight for freedom of speech in cooperation with Norwegian PEN, for which she currently serves on the Board of Directors, as well as maintaining her contacts in the Iranian community of human and women’s rights. 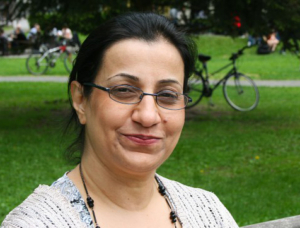 Forfatter Soudabeh Alishahi er styremedlem i Norsk PEN og var fribyforfatter i Oslo fra 2001 til 2003. Soudabeh kommer opprinnelig fra Iran, og begynte å skrive allerede som tenåring. Etter at hun i 1999 fikk publisert sin første novellesamling, som ble oppfattet som regimekritisk og blant annet omhandlet kvinners manglende rettigheter i Iran, mottok hun trusler, ble arrestert og fikk utreiseforbud. Hun flyktet fra landet i 2000, og fikk deretter opphold i Oslo i 2001 som byens første fribyforfatter. Novellesamlingen «Midtveis» var hennes første utgivelse på et norsk forlag. Nå er hun aktuell med sin nye roman, «Smil», som nettopp er kommet ut på Gyldendal. «Smil» handler om Partow, som bor utenfor Teheran med mannen Jones og svigerfaren Haji Barat. Partow er assistent i en frisørsalong, Jones er gal og svigerfaren en sterkt pleietrengende krigsinvalid. For at hverdagen skal gå rundt, har familien ansatt afghaneren Soleiman, han skal på ulike måter bidra til at både far og sønn får den hjelpen de trenger. Historien fortelles av Partow, men da hun får tak i Soleimans dagbok, veksler romanen mellom hans nedtegnelser og Partows egen fortelling. Med en god porsjon galgenhumor og stor innlevelse fletter Soudabeh Alishahi det iranske dagliglivet og den politiske virkeligheten før og etter innføringen av prestestyret sammen i en roman utenom det vanlige.